How important is a good breakfast? Some experts say it can improve mental focus, help regulate blood sugar, shape how you will eat for the rest of the day, and increase exercise endurance. Others say that research on skipping breakfast is biased and misleading. Who is right? My take? Every meal is important. Every food choice counts. I count breakfast equally important as any meal because the name of the game for me is overall nourishment. Will an innocent little old blueberry muffin really ruin your day? 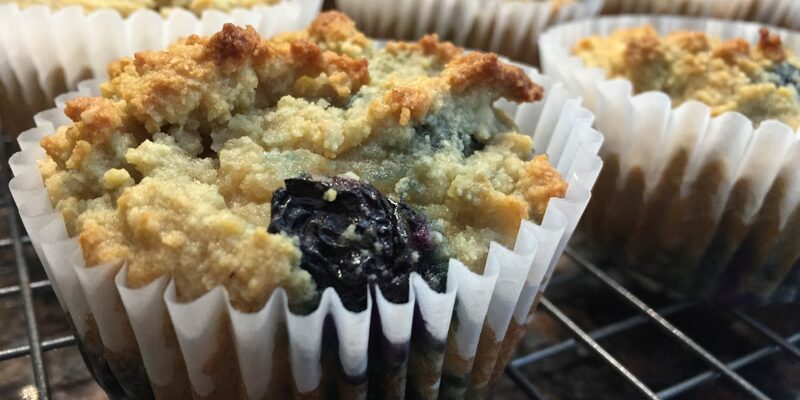 Maybe all blueberry muffins are not created equal. What Makes a Good Grain-free Vegan Blueberry Muffin? Ingredients that do little damage, and even help overall nutrition. Good fats, like almond flour, and olive or coconut oil combat sugar and hunger cravings. 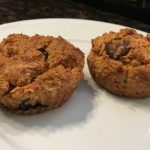 The texture of my grain-free, vegan muffin is light, fluffy, and moist. A real victory for me! Raw, blanched almond flour is rich in omega 3 fatty acids. Almonds contain protein and fiber. Olive oil is rich in omega 9 fatty acids. Coconut is rich in lauric acid, which is converted in the body into a compound called monolaurin, an antiviral and antibacterial that destroys a wide variety of diseases. This is why coconut products are revered to be anti-microbial, helping to guard the body against infections. However, I think it’s important to remember that coconut is high in saturated fat. While its fatty acids are short chain fatty acids, like those found it ghee, making them more easily metabolized and less likely to be converted to fat, if they over consumed by some people, they could pose a risk for heart disease. While they are a better source of saturated fat than red meat or heavy cream, if you have borderline or high cholesterol, you may choose to limit the amount of coconut foods you consume to 2-3 times/week. Keeping the added sugar in check. 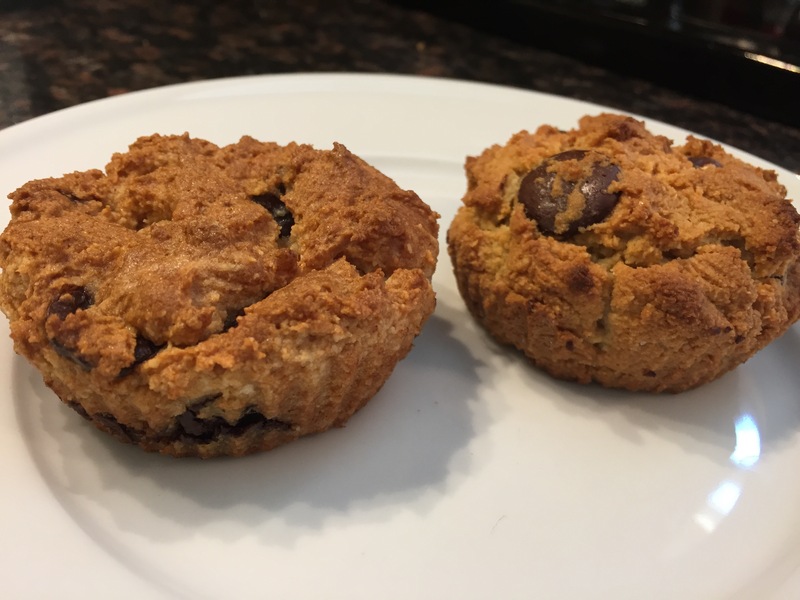 Can you tell which grain-free, dairy-free muffin is egg-free and which muffin has egg? Perhaps the most critical and difficult challenge to creating any guilt-free treat is keeping sugar in check. High sugar consumption contributes to most health issues, weight gain, obesity, type 2 diabetes, heart disease, high blood pressure, the list goes on. The RDA for sugar is 6-8 tsp of added sugar/day. There is 4g of sugar per tsp. This is a total of 24-32g of added sugar allowed per day. A small-medium sized muffin typically contains 22-30 g of sugar. spilled into the next day’s sugar, and you haven’t even gotten to lunch. 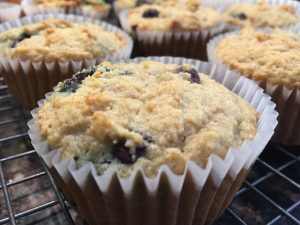 My guilt-free, grain-free, vegan blueberry muffins have about 5g of added sugar per muffin depending how many blueberries you add. You still have 5-7 tsp more for the rest of the day. 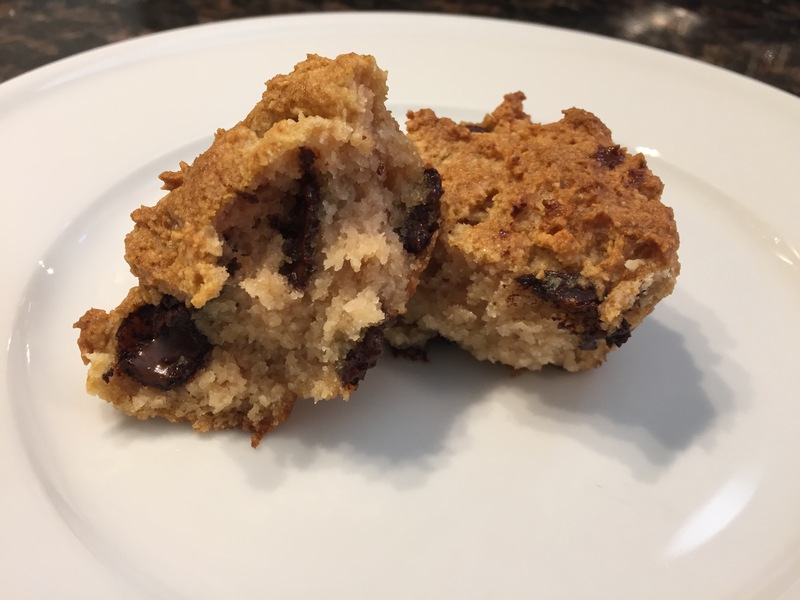 This low sugar count is dependent upon using unsweetened plain non-dairy milk and unsweetened plain applesauce. Sugar hides is almost all foods so it’s critical to buy plain and unsweetened varieties so you aren’t consuming unwanted and unneeded sugar. Why Maple Syrup or Raw Honey? Less processed and lower on the GI than other sweeteners, maple syrup and raw honey are considered to be whole foods. If I use honey, I use raw honey to ensure that it’s not highly processed and remains low on the GI. Regular honey can be as high on the GI as white sugar, depending how it’s processed. You can use agave nectar in this recipe as well. Agave nectar is typically low glycemic, but it’s high in fructose, which is difficult for some people to digest. If you find it causes bloating or gives you gas, it may not be the sweetener for you. If you choose agave nectar, as with honey, I recommend choosing a brand that does not highly process or heat its product. Applesauce works as a binder and a sweetener. It adds fiber, flavor, and mild sweetness. There is minimal sugar in unsweetened applesauce, and it comes from fruit. Be sure to buy plain, unsweetened. What is Tapioca Flour? Why Use It? Tapioca flour version of muffin on right, coconut flour version of left. Tapioca version has a little more height and lift, but both are delicious! Tapioca is the starch that is extracted from yuca root. It’s gluten-free and grain-free. I like to combine a little of it with other gluten/grain-free flours because it adds texture and lift that mimics the experience of eating baked goods with wheat flour. 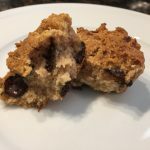 However, if your digestion is not strong enough for starches, you will be better served using the almond/coconut flour version of this recipe. The muffin will be a little more dense, but just as delicious! Is a Guilt-free Grain-free Blueberry Muffin a Good Breakfast? 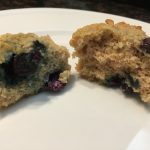 For me, a guilt-free, grain-free blueberry muffin is a treat that doesn’t undo all of my hard work for the day. It’s not doing damage and has some benefits, but it’s not a meal replacement. Nutritionally, I think it’s best paired with something high in protein to make a complete breakfast. That way, I won’t over-indulge in sugar or fats and get a more complete meal. Remember, overall nutrition is the name of the game! Pair it with my regular breakfast, perhaps a kefir-protein-collagen-super greens-smoothie, to make sure I get enough protein. Eat no more than one. Don’t eat them (or a treat like them) every day. In other words, treats are not part of my routine. They are treats. That’s what makes them special! If you don't eat tapioca flour use 1 TBS coconut flour instead and increase the almond flour to 2 1/4 cups. Line a 12 count muffin tin with muffin holders. 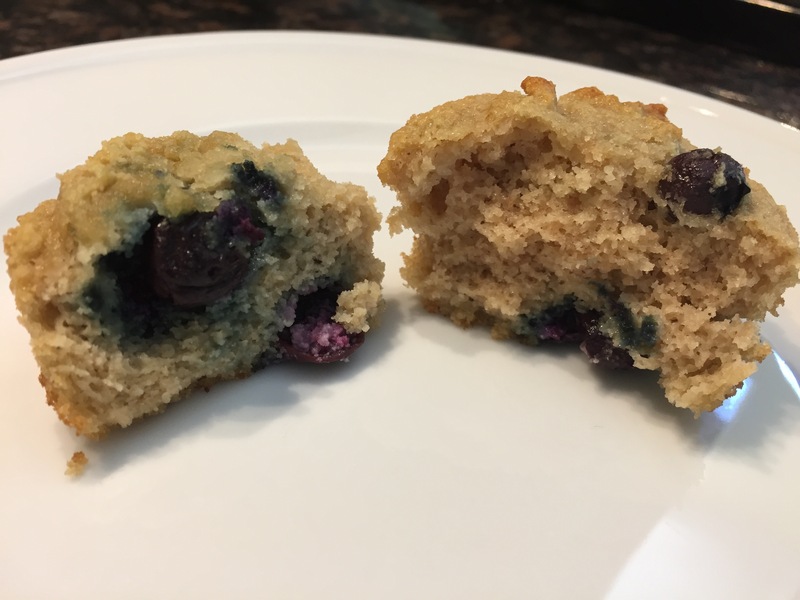 Lightly toss blueberries in 1 tsp tapioca or coconut flour. Make sure berries are dry first. This will help prevent berries from sinking to bottom of muffins. In a medium mixing bowl combine dry ingredients. Stir together by hand with a spatula. In a separate bowl, whisk together oil, sweetener, lemon juice or extract, and non-dairy milk. Pour wet ingredients and applesauce into dry ingredients. Mix well or fold with spatula until combined. Fold in blueberries. Fill each cup 3/4 full. I use an ice cream scoop for consistent sizing and ease of use. Bake in preheated 350 degree oven. Bake 18-20 minutes, until lightly browned and tester comes out clean when inserted. Remove muffins from oven and place on a wire rack. Remove muffins from pan as soon as they are cool enough to remove. Cool on wire rack. In a separate bowl, whisk together egg, oil, sweetener, lemon juice or extract, and non-dairy milk. Pour wet ingredients and applesauce into dry ingredients. Mix well or fold with spatula until combined. Fold in blueberries.